Kevin J. Bozant was born in the Upper 9th Ward of New Orleans – as luck would have it – just a few blocks from Huerstel’s Bar and Little Pete’s Seafood Restaurant. He is a local author, photographer and digital graphic designer for his publishing company, Po-Boy Press – New Orleans. His professional experience includes Warner Brothers, CW and ABC television affiliates. Kevin specialized in sales, marketing, promotional graphics and special events coordination. He eventually became senior graphic designer for the news, sports and weather departments. He was font operator for fifteen seasons of Friday Night Football as well as Saints Sideline with Ed Daniels. Kevin provided technical assistance on location shoots for Real New Orleans with Ronnie Virgets, Crescent City Country with Kim Carson, co-produced New Orleans after Midnight with Bernie Cyrus and developed and co-produced The Southern Garden for Vitascope Television. 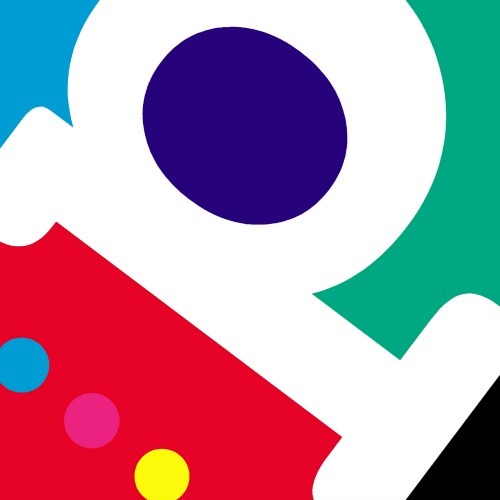 He also served as studio graphics manager and question writer for Brandon Tartikoff’s popular New Orleans trivia game show N.O. It Alls. Kevin showcased his warped opinion of local politics and culture as writer and editor of the “Crescent City Crier” a political cartoon published by Gambit Weekly. He is author and editor of Port & Burgundy 1840-1990: A Pictorial History covering 150 years of St. Paul German Lutheran Church and Faubourg Marigny; Quaint Essential New Orleans: A Crescent City Lexicon; African American New Orleans: a Guide to 100 Civil Rights, Culture and Jazz Sites; Crescent City Soldiers: Military Monuments of New Orleans as well as Music Street New Orleans: A Guide to 200 Jazz, Rock and Rhythm & Blues Sites. No other city in America appreciates and celebrates the African American cultural landscape as does New Orleans. There are 73 distinct neighborhoods in the Crescent City. 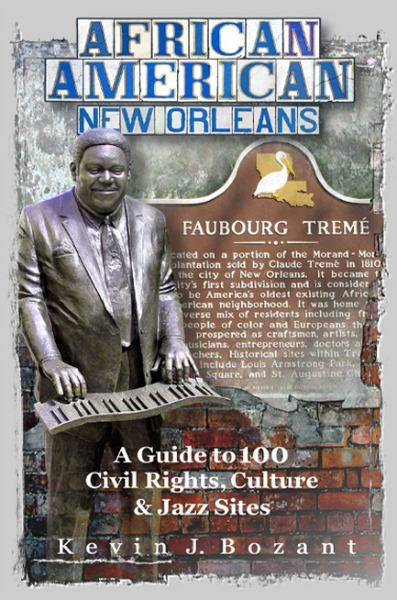 In three adjacent neighborhoods alone – Faubourg Tremé, Faubourg St. Mary and the French Quarter – there are more than fifty statues and historic sites honoring African American contributions to the cultural and civil rights history of New Orleans. In the fifteen neighborhoods mentioned in this book, there are well over one hundred. African American New Orleans is an essential and valuable reference for everyone visiting New Orleans; especially during Mardi Gras, Audubon Zoo Soul Fest, New Orleans Jazz & Heritage Festival, The Essence Music Festival, Juneteenth, Satchmo Summerfest, The New Orleans Blues & BBQ Festival, The Bayou Classic and Kwanzaa. It is also a guide for residents of the New Orleans area who may not be aware of the history surrounding them. Volumes have been written about New Orleans civil rights history. Library shelves overflow with extensive works about the origins of jazz and the unique culture of the Crescent City. This book, however, is written with the visitor in mind by providing over 100 photographs accompanied by concise, informative text describing the significance of each site. In addition, neighborhood and street addresses are provided which can be quickly located via your smart phone map application. There is also a convenient neighborhood index on page 127 to help you find sites close to your current location. This book also serves as a helpful study guide for New Orleans school students and teachers; providing a framework for discussion and further research into the fascinating social and multi-cultural fabric of African American New Orleans. If you write about New Orleans, get it right about New Orleans. In Quaint Essential New Orleans, Kevin J. Bozant takes you on an entertaining and personal journey through the Crescent City’s culture of unique iconography, creative geography and mystifying terminology. He offers readers a generous serving from the colloquial melting pot with ingredients borrowed from the French, Spanish, Creoles, African Americans, Cajuns, West Indians, Irish, Italians, Germans, Native Americans, Canadians, Vietnamese and a smattering of Yat mixed in just to make your mom-n-em happy. The resulting mélange of creative and colorful references for streets, food, Mardi Gras, jazz, local characters, geography, history and culture, blends into a delicious gumbo of grammar which is often mispronounced, misinterpreted, misunderstood and misspelled. Do you know the difference between, Mardi Gras and Carnival, Storyland and Storyville, roux and rue? Can you give directions to Dead Man’s Curve, Monkey Wrench Corner or Pigeon Town? Can you name the Emperor of the World, the Voodoo Queen or the Chicken King? Do you know what it means to mispronounce New Orleans, banquette, Tchefuncte, flambeaux, Tchoupitoulas or lagniappe? If you are producing a movie or documentary in New Orleans. If you are writing or anchoring a local newscast. If you are editing a city newspaper, magazine or website. If you are writing a television series set in the Crescent City. If your next novel is about New Orleans. In Crescent City Soldiers, author Kevin J. Bozant surveys over 125 military monuments, memorials and markers located throughout the greater New Orleans area. This 156-page volume is generously illustrated with 200 photographs and includes the Central Business District, Chal-mette, Vieux Carré, Lakeview, Metairie, Ninth Ward, Mid-City, Faubourg Tremé and the entire Uptown District. The beautiful neighborhood parks, neutral grounds and historic ceme-teries of New Orleans reveal an impressive collection of enduring tributes to local, national and international military heroes honoring their service and courage in the name of peace and liberty. Each monument is accompanied by brief, informative text describing its meaning and military significance. In addition, neighborhood and street addresses are provided which can be easily located via your smart phone map application. 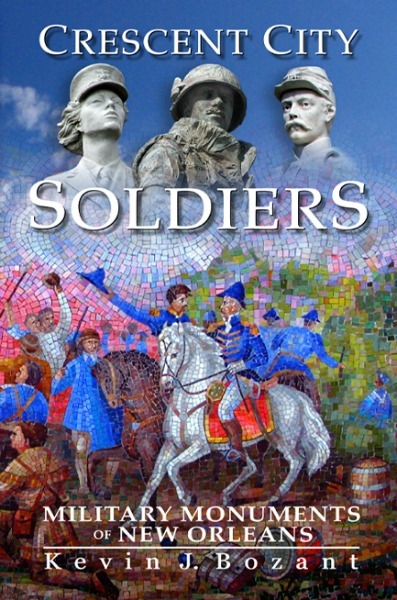 You will also find information on military museums, forts and various insignia of veterans organizations such as the Veterans of Foreign Wars, Grand Army of the Republic, Daughters of the American Revolution, United Daughters of the Confederacy, Sons of the American Revolution as well as the United States Daughters 1776-1812. This book includes some of the earliest memorials honoring soldiers who served during the American Revolution up to the recent unveiling of the Louisiana Submariner Memorial. An informative index organizes the various monuments and memorials into a chronological list of engagements beginning with the Revolutionary War and leading up to recent actions in the Middle East. Join this patriotic excursion exploring our military monuments and memorials which pay silent testimony to the valiant men and women who so courageously defended our nation. 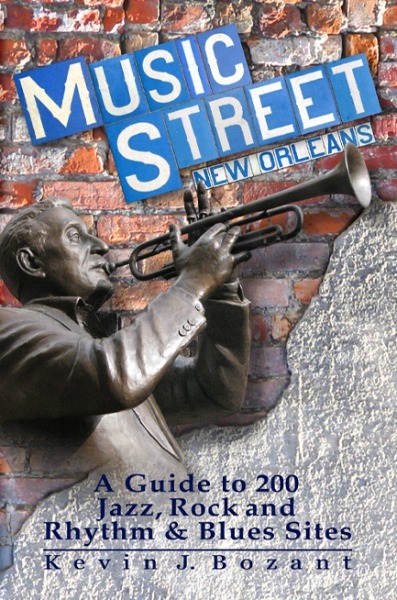 Join the “second line” with local author Kevin J. Bozant as he takes you on a neighborhood tour of over 200 music sculptures, markers, parks, murals, historic sites, statues, museums, festivals, plaques and cultural references celebrating the Jazz, Rock and Rhythm & Blues heritage of New Orleans. At any moment in time, a musician in the Crescent City is rehearsing with the Marching 100 in the 7th Ward, playing the B-3 in Gert Town, harmonizing in Zion City, practicing piano at SUNO, jazzing it up at Preservation Hall, glorifying in a Mid-City choir, blowing a horn on Bourbon Street, marching in a Tremé brass band, second lining in a jazz funeral, conducting an orchestra for Broadway South or jamming on Frenchmen Street. Music isn’t just a way of life in New Orleans. Music IS life in New Orleans. In 1987, the United States Congress designated jazz “a rare and valuable national American treasure to which we should devote our attention, support and resources to make certain it is preserved, understood and promulgated.” On October 31, 1994, The National Park Service (NPS) established the New Orleans Jazz National Historical Park focused on the early culture of traditional jazz. Together with the New Orleans Jazz Commission, the NPS created a series of tour maps of historic sites relating to the early history of jazz in the Crescent City. Over 60 of these sites are included here. In 2002, The Preservation Resource Center (PRC) and the New Orleans Jazz Commission, launched the Jazz Plaque Program in an effort to identify and preserve many of the residences of local musicians associated with jazz. More than 35 of these sites are included in this book. Every street is Music Street.